After second-year Red-tailed Hawk – Buteo jamaicensis. 11 x 17″ Pen and Ink on bristol. I view illustrating birds as an exercise of my ability to create an accurate rendition of my subject. I’ve recently began recognizing a need to incorporate study into this exercise, and as I stated in a previous post, I plan to do so by first illustrating and then reading a scientific article that pertains to my subject. But, I’d like to add another component to my illustrations. I want to make an image that communicates useful information. 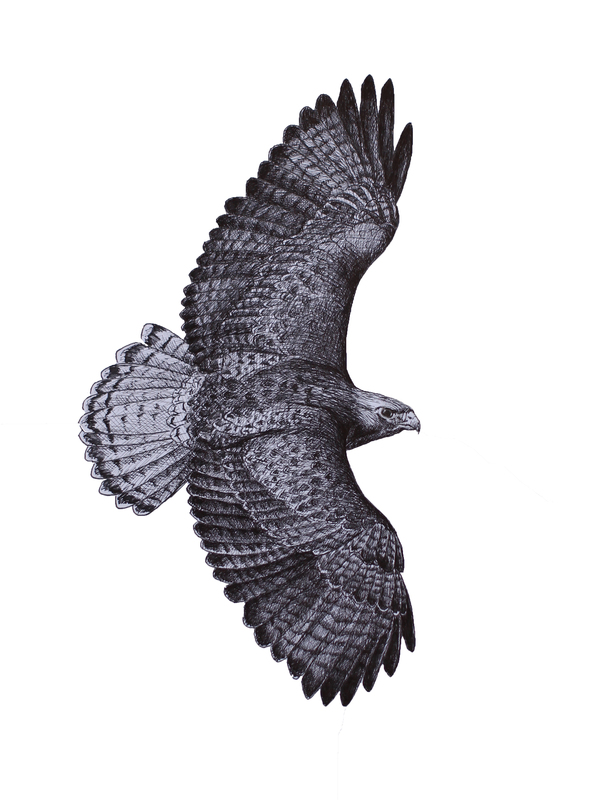 I was asked to illustrate a Red-tailed Hawk in black and white, so I took the request and made it an opportunity for me to try a concept I’ve been thinking about. I want to create images that I can teach from, or that simply communicate information for those looking to learn something about each bird. For the Red-tailed Hawk, I wanted to create an image of a bird that could be aged, as if it were a real bird being scrutinized by a biologist. The above bird is my first attempt at illustrating staffelmauser, or staggered molt. Through illustrating this as it is seen on actual hawks, I made an attempt at communicating the necessary information for age determination. This hawk is an adult, as dictated first by shape. The wings are broader, giving the tail a shorter appearance as well. The presence of a thick subterminal band on both the tail and wing also indicate that this bird is older than a juvenile. In age determination terms, it is at least “after hatch year”. But, we can take it further. The next step would be to search for molt limits in the flight feathers, that is the presence of retained feathers. Retained juvenile secondaries would be shorter than adult feathers, and lack a thick subterminal band. If this is found, then the bird is in its second year. I illustrated the bird with two generations of adult feathers in its secondaries, and two waves of molt in its primaries ( the staffelmauser, or step-wise molt). The older feathers are paler, as they would be in an actual Red-tailed Hawk. Because of these two generations of adult feathers in the secondaries, we know that this bird is an “after second year”. Tail banding in Red-tailed Hawks is variable. Many “western” birds, subspecies calurus have multiple banded tails in their definitive plumage. So, this is a useless trait for age determination. To read more, and for a more clear and detailed explanation by the expert, check out a recent article written by Jerry Liguori on Hawkwatch International’s blog. After all I produced the image I was hoping for, but it isn’t as correct as I’d like it to be. That is the exercise. Each time I finish an illustration, I take a few days to let it sit and be, then return and look for areas that I need to improve. This time I requested some additional critique from a knowledgable (understatement) friend. I now have a list of things to pay attention to the next time I illustrate this bird. I like where I’m at, but I see the need to keep going.